Elie Wiesel will “spend time” at Chapman University in Orange, California beginning this spring and for the following four years, through 2015, according to Chapman President Jim Doti. Wiesel has been appointed as a “Distinguished Presidential Fellow”, which means he will visit classes in Chapman’s Holocaust history minor, and possibly other disciplines, including history, French, religious studies and literature, according to chapmannews. Chapmannews reports that complete plans for his fellowship activities are still in progress (as of August) and that he will retain his full-time faculty position at Boston University. As we have pointed out on this website, Wiesel’s duties at BU are light, leaving him time for his extra-curricular activities, now including being employed by a second university. However, Wiesel’s fellowship stay is also described as amounting to only “several days each spring.” My! “Visit” is certainly the right word for it. “Distinguished Presidential Fellow” may be a newly invented position, meaning that he is appointed by the President (Jim Doti), not hired under academic requirements by a department dean. Wiesel will be what you might call, in diplomatic terms, an at-large representative of the Jewish interests that are no doubt paying his salary. He will be most closely associated with Chapman’s Rodgers Center for Holocaust Education, a unique construction that bridges the Religion and History Depts, and was opened in Feb. 2000 “through a generous gift from Barry and Phyllis Rodgers, [and] dedicated to preparing young people to become witnesses to the future.” Witnesses of the Holocaust? Is this the job of a university? Well, it seems to depend on who offers the money, and what they want it to be used for. Does it seem from this that Wiesel will be under any kind of performance requirement at Chapman, or will he be the determiner of his own course of action? It is probably the same at Boston University – the tail is wagging the dog. But Wiesel’s presence at both universities is more a public relations benefit to the school than an educational benefit for students. His fame as a Holocaust icon, including his Nobel Peace Prize, make him a valuable commodity – as opposed to having any pretensions to scholastic stardom. Chapman University is seeking to transition from a “teaching university” to a “research university.” That means the faculty will be required to “publish” in the field of their expertise, and the more you publish, the higher your pay. Not all faculty think this will be beneficial to the student experience at Chapman; there is a school of thought that values professors as mainly teachers rather than researchers. But others, probably more powerful, think it’s more important to “upgrade” Chapman into a higher-rated university. Elie Wiesel’s visiting fellowship may be in accord with those objectives. The Sala and Aron Samueli Holocaust Memorial Library opened in April 2005, dedicated to providing a space “where teachers and students may gather to learn from survivors, visual testimonies and printed resources.” At the entrance to this library is a large bronze bust of – guess who? 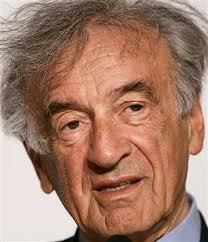 Elie Wiesel! The library has an exhibit area that currently displays “Themes of the Holocaust” featuring photos and artifacts donated or lent by individuals and institutions. Group tours are also arranged. It’s like a little Holocaust museum right there on the university grounds. At Chapman, the Holocaust is taught in both the Religion and History Depts., and several of the courses overlap both. It is really quite amazing how much of the History curriculum is devoted to this subject. That Holocaust is taught in the Religion Department—as it is at Boston University—makes sense because it is a belief. It has become an unquestioned, highly enforced belief system that is assumed to be true at its base, but with too little examination of the basic operations it would require. This course explores the complex history of the Holocaust from the perspective of selected memoirs written by survivors and examines the contributions and limitations of memoirs in shaping the historical record. (Offered spring semester, alternate years.) 3 credits. This course examines the political, social, and intellectual history of Germany from World War I to the end of World War II. Topics include the Holocaust and the roles of individuals in taking Germany down the path to two world wars. (Offered as needed.) 3 credits. An introduction to the history of the Holocaust, from initial persecution to the implementation of the Final Solution, including the actions of perpetrators, rescuers, and resisters; the dilemmas facing those targeted for persecution, and major issues in the interpretation and visual representation of the Holocaust. (Offered as needed) 3 credits. In addition to all of this, there is the extensive program offerings of the Rodgers Center for Holocaust Education, which is entirely funded by several Jewish groups outside the university. According to the Chapman website, the mission of the Rodgers Center is to increase knowledge of the Holocaust, further discussion of the causes of genocide, and encourage reflection on the contemporary relevance of the Holocaust to our lives today. The Art and Writing Contest is an annual program that involves “thousands of Southern California middle and high school teachers and students, culminating in an awards ceremony on campus. Beginning in 2000, the Rodgers Center began a yearly Evening of Holocaust Commemoration to create a “community of witnesses” for the Chapman area. What more can they think up?! No one can deny that Holocaust is alive and well at Chapman University. And now Elie Wiesel, the “Grand Poobah” himself, will arrive every spring to energize it even further, and bring lots of media attention in his wake. This is a public relations dream! But for those of us who care about the truth, it’s more like a nightmare. What do you think, dear reader? Given the number of people I’ve met who were there at Krystallnacht through the liberation of the camps, it’s clear the effort you’ve put into this website for the last 8 years has been an irrelevant waste of time. The information here may prove interesting to your fellow Nazis, but to the average reasonable person there is nothing of value here whatsoever. D. Greene – Then why are you wasting your time to read, write and send this comment? You probably know this website reaches a lot of people, consistently, for 8 years. And I’m not shutting it down, sorry. I bet you don’t even know where the so-called Krystallnacht supposedly took place. I bet you couldn’t say one intelligent thing about it.